Conduct Council Polls Soon – Ortom Urges New BESIEC Chairman | your dependable source for the latest news, music & general information. 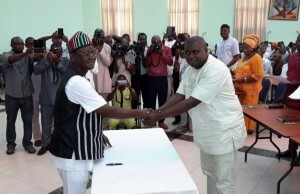 Benue State Governor, Samuel Ortom, today charged the Benue State Independent Electoral Commission, BESIEC, to conduct council polls in the state as soon as possible. “You must therefore hit the ground running by putting in place the machinery to conduct local government elections as soon as possible,” he stated. “I charge you to conduct transparent, credible, free and fair council polls even as we pledge to respect the verdict of the people,” he stressed.